Back by popular demand – ITS ANOTHER HAPPY MONEY SAVER RESEARCH PROJECT! 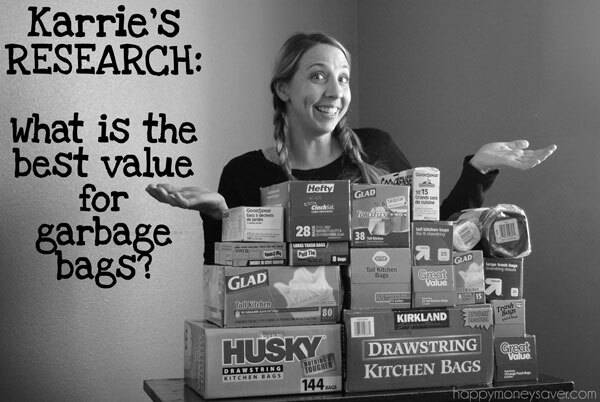 I know it doesn’t get much better than toilet paper but this time I wanted to find out which garbage bags were the best value . As you know, not all garbage bags are created equal; you have drawstring, flap ties, tear resistant, force flex, scented and more. The choices for garbage bags can seem endless and it can be really hard to know which is the best value and quality for your hard earned money. I love these kinds of research projects! You can also see my posts on Best Value on Toilet Paper and Best Prices for paper towels. These research projects are fun for me as I love knowing how to save money on things I buy all the time. I plan to doing a new research project each month for my awesome readers. Doing research on what the best value for garbage bags has been something I have been curious about for awhile (ok maybe I need a life!) As a coupon shopper I haven’t seen too many amazing deals on garbage bag coupons and I wanted to find the best place to spend my money. I also wanted to test the quality because I know there are some really cheap generic brands that break easily. There is nothing worse than having your garbage bag break open all over the place. It’s messy, gross, and nobody likes doing the leaky garbage bag dash to the outside bin. I created a spreadsheet you can view that shows regular price, brands, the price per bag, and gallon size of bags from the 6 stores. Feel free to print this out, and keep it in your purse/wallet as a reference guide. To test the strength of the garbage bags I decided to use a 15 lb. 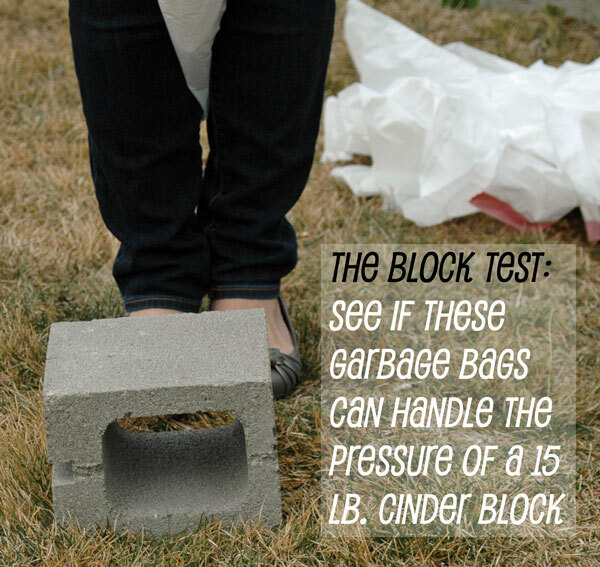 cinder block. It’s got a rough texture and heavy enough for me to see if these bags could handle the weight. 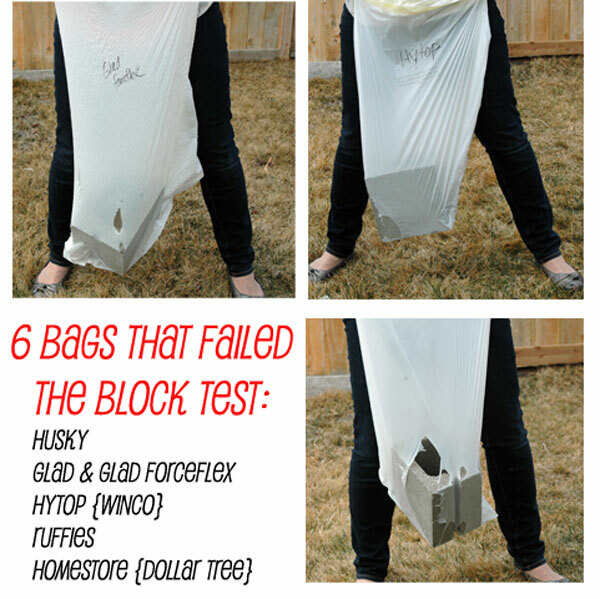 Many of these bags failed this test. One of the dollar store bags broke super fast. And the Glad bags? Let’s just say their results did not make me “Glad.” I also tested the Winco’s Better Value brand, and the block tore & broke right though as well. Now I know that the Glad Force Flex has been rated really high by consumer reports, and you might be wondering why it’s name is on this FAIL LIST. While it never did break open totally, the pressure did create some smaller tears as you can see if the picture. If I had something heavy or sharp in my garbage plus something like pine-shavings from cleaning out my chicken bins, I would really hate for my bag to start tearing/leaking. So I added it to the fail test. All the others the block actually broke all the way through on this fail list. 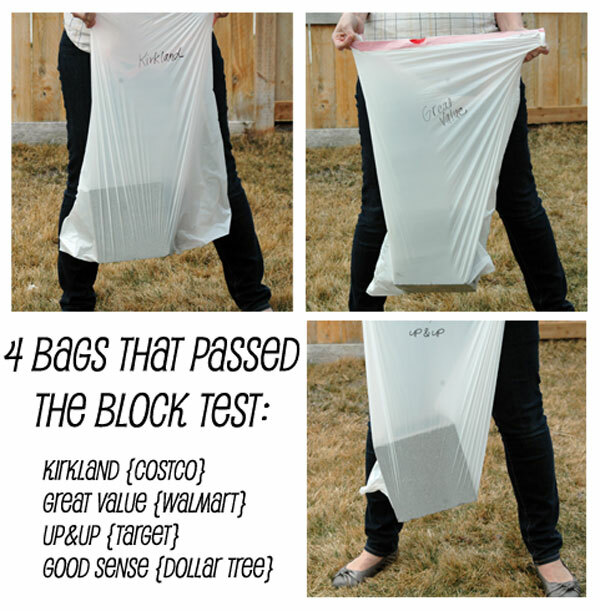 Here are the garbage bags that passed this test! Kirkland, Great Value, Up & Up and Good Sense did not break. I was actually quite shocked that the Good Sense Dollar Tree brand was that strong – but their bags were only half the width of the other bags, (small & skinny) so that’s why they still aren’t making it in my top winners lists. 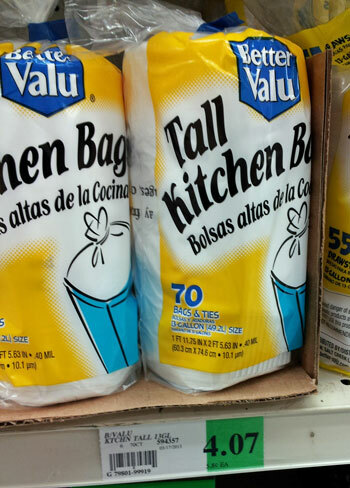 The #1 best price per bag for 13 gallon kitchen size was Winco’s Better Value twist tie variety at $0.058 cents per bag. This one doesn’t have drawstrings, its just a basic plastic garbage bag that uses twist ties. But it wasn’t good quality because the block tore right through it. While the price is good, it is just not worth it if it isn’t strong enough to handle a large bag of garbage. Plus I just have to have drawstrings. I don’t like trying to tie a knot in the bags. 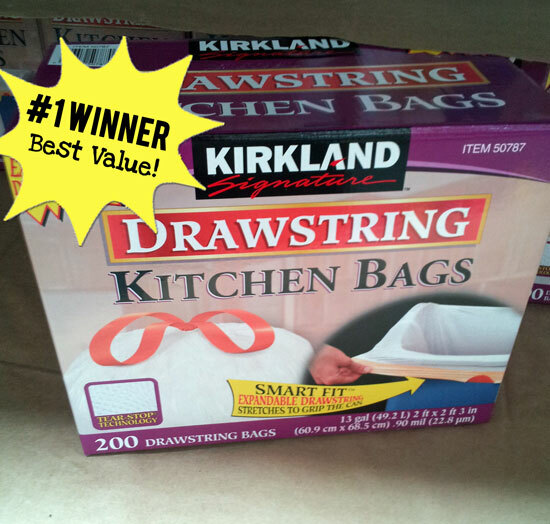 My final winner for all around best value goes to Kirkland (Costco) brand plastic garbage bags with expandable drawsting. You get 200 of them for $13.99 (which is $0.07 per bag). They were strong enough to hold my 15 lb. block and not tear or break! Plus they were a nice quality bag and at this price it’s the natural winner. If you don’t have a Costco membership I will give you my second favorite value choice. 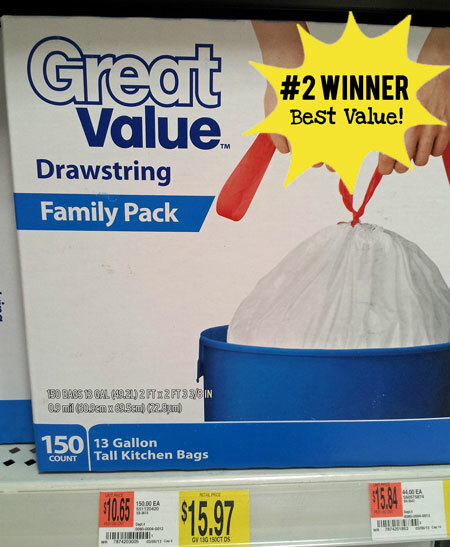 My #2 is Walmart’s Great Value Drawstring 13 gallon kitchen bags. They are thick and smooth so they will slide out of the can easily. Plus the drawstrings are strong and don’t tear. It also passed the block strength test. They cost around $0.10 per bag and you would need to buy the 150 pack of them for this price at Walmart. 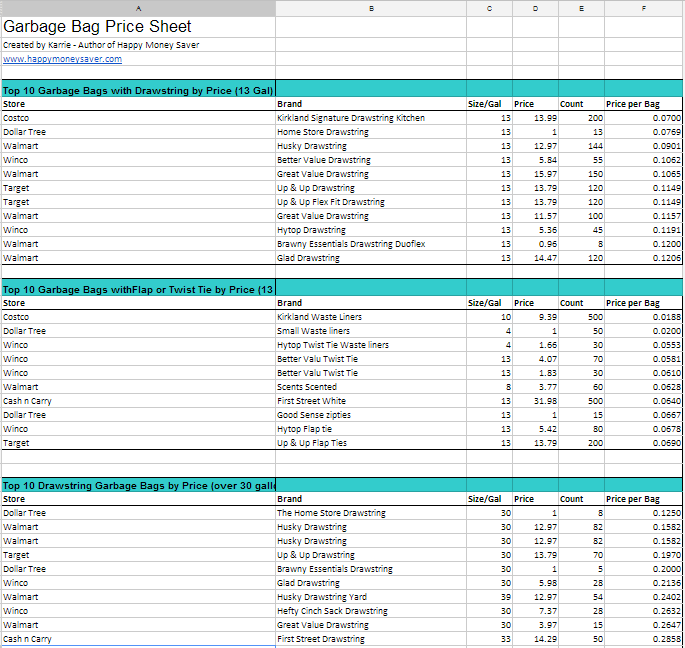 I didn’t do any tests or comparisons on the black 30+ gallon bags or the smaller sizes of garbage bags, but the prices were all included in the google spreadsheet. I hope you enjoyed my research project! Make sure and subscribe to my email newsletter so you don’t miss out on all my fun posts. When we used to use garbage bags, we tended to buy the expensive construction clean up bags, because of having so much trouble with breakage. I quit buying garbage bags altogether about 9 months ago. We now reuse other types of bags for garbage. A quick note, reading this in 2017. Those 200 count Kirkland bags now cost $25.99. Holy inflation!! Googled about this today 04/19/17 to see how many I should buy for a year ( there are 2 of us and I am using 1 bag a week, or try to) anyhow.. Walgreens this week has a GREAT buy Hefty on sale for 6.99 for 80. I used a 1.00 coupon so 5.99 AND their special for the week is if you buy 30.00 of select products (Hefty is one that qualifies) they give you 10.00 back in extra buck rewards. Anyway each bag costs ya 0.074 each. Love getting cash back !